York’s turbulent history can be traced back nearly 2,000 years. It begins in earnest in AD71 when the Romans, at the height of their powers, conquered the Celtic tribes known as the Brigantes and founded Eboracum which, by the fourth century, was the capital of lower Britain. In the seventh century, known as Eoferwic, it was the chief city of the Anglo-Saxon King Edwin of Northumbria and, two centuries later as Jorvik, it became an important trading centre for the Vikings. The city was ravaged by William the Conqueror, but by the Middle Ages it had again become an important commercial centre. In the sixteenth and seventeenth centuries Tudor and Stuart kings were among its visitors, in Georgian times it was the social capital of the north, and in the 19th century, with the coming of the railway, its industrial future was assured. Today, while trade and industry are still important, it is the preservation of its long and varied history which has brought it world fame. 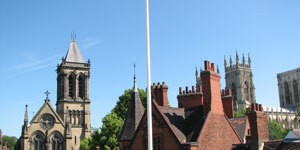 For here, visitors can not only hear about England’s history, they can actually see it and walk in it. Dr John Bowes Morrell and his brother Cuthbert had been buying, restoring and rehabilitating medieval properties in York for many years when they formed Ings Property Company Ltd in 1945. 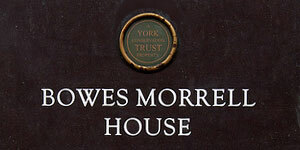 Following their deaths this continued under the guidance of Dr Morrell’s son, William, until 1976 when these properties were bequeathed to charity and the company’s name changed to York Conservation Trust Limited. From its beginnings in 1945 with 7 properties the Trust now owns and runs over 85 buildings, consisting of 79 residential and 66 commercial lets. Restoration and conservation has to be balanced with the need to put the building to its best use, both from the point of view of its tenants and in the life of the City. One of York’s many claims to fame The massive and magnificent York Minster is the largest medieval gothic cathedral north of the Alps and hosts a treasure house of beautiful examples of stained glass windows.